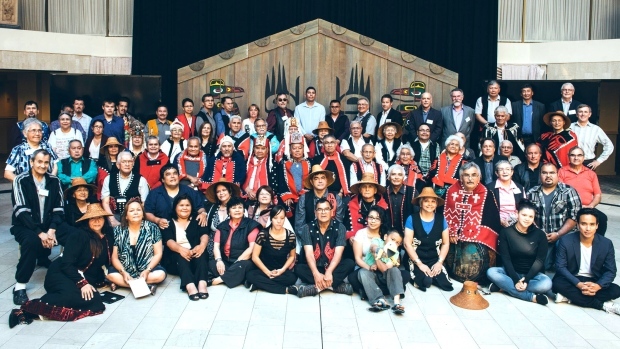 Key First Nations in northern B.C. 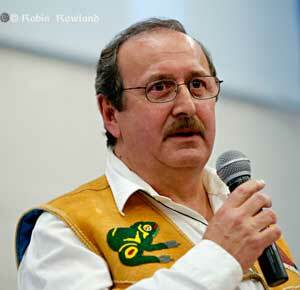 refute there is consensus on an oil pipeline concept initiated by some coastal First Nation members. Eagle Spirit Energy has issued a trio of news releases in the past week, claiming it has signed agreements and has the support of chiefs along the route of its proposed project — an alternate to Enbridge’s stalled $7.9-billion Northern Gateway project. Calvin Helin of Eagle Spirit Energy, which proposes a bitumen refining facility prior to transporting Tar Sands by pipeline to the coast. Companies behind refining proposals are trying hard to avoid the mistakes Enbridge made on Northern Gateway pipeline—but an uphill fight awaits. Despite last week’s approval from the Canadian government, uncertainty still dogs Enbridge Inc.’s Northern Gateway oil sands pipeline largely because of a vow from key aboriginal communities to block it. Others in the oil industry are trying hard to avoid the mistakes Enbridge made when it comes to approaching Canada’s powerful First Nations about projects that could contaminate their lands and waterways. 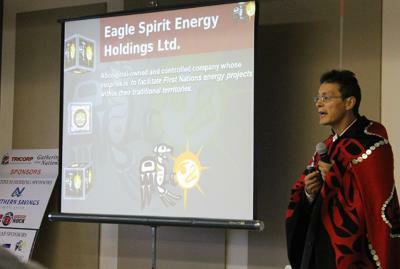 Calvin Helin doing power point presentation in his button blanket regalia.